Well hello there! I'm Ruby, a very loving, sweet, and well-behaved apricot-and-white tabby girl who was born in the fall of 2012. Call me Miss Congeniality because I just love people!! Also I like to snuggle up to my foster mom so she can be sure and hear that my loud purring sounds like a perking coffee pot. Plus I'm playful too. My laser mouse is my favorite toy. I'm unusual because most ginger tabbies are male, but I'm a little girl who's all 'sugar and spice and everything nice.' My palette is almost the color of a cameo -- soft apricot with my white bib, mittens, and high go-go boots. I will dazzle your eyes -- like you would expect from any ruby! In early 2017, I had my dental woes from gingio-stomatitis, but no worries -- I'll never have annual dental cleanings again because almost all of my teeth have been extracted! Although my foster mom sees to it that I get my share of canned food, believe it or not, my gums have healed enough that I can eat dry kibble again. One caveat about me is that I need to be the only cat in the house, but if a gentle dog (like the little one in my foster home) will not hassle me, I will be fine. I was surrendered to a kill-shelter because my human companion's new husband was allergic to me, but I am staying positive and just know that my next home will be for my lifetime. If you're looking for an affectionate, attentive companion, I'm PURRFECT. Please make plans to meet my sweet, loving self today! Ruby is updated on shots, spayed, dewormed, microchipped, FIV/ FeLV negative, and ready for her indoor-only home. Her adoption fee is $100, cash or check payable to Buster's Friends. 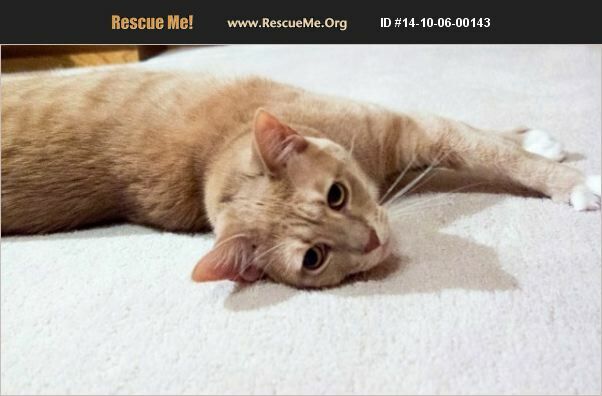 Please click the contact button so we can arrange for you to meet this rare and delightful apricot tabby girl. To adopt one of our cats, you must fill out our adoption application and be approved by one of our adoption counselors. To make the process more efficient, submit the online cat adoption application at https://www.bustersfriends.org/cat-adoption-application.